The Date field allows users to type in a date or select it from a pop-up calendar. A Date field stores values in the Y-m-d format but the field displays dates in the format selected in your Formidable Global Settings. 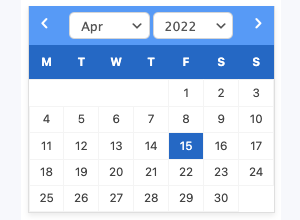 In addition to the standard field options, a Date field has a few field specific options. Choose which language you would like your calendar to display. This will set the start date to 50 years ago and the end date to the current year. You may change 50 and 0 to any integer. Set the style for your calendar in Formidable → Styles → Date Fields. You may adjust the styling of your head color, text color, and band color. Formidable Forms comes packaged with the UI Lightness datepicker styling. If you select a different style, it will be loaded externally from https://ajax.googleapis.com. If you would like to host this styling on your own site you can do so. Go to the jQuery UI themeroller page and click the 'Gallery' tab in the sidebar. Click the 'Download' button next to the style you selected in your Formidable styling settings. This will take you to the 'Download Builder' page. Scroll to the bottom of the page and click the big, black 'Download' button, no changes required. Unzip the downloaded files and rename the folder to the name of the selected theme. For example, if you selected 'Start' for the theme, the folder name should be 'start'. This is case sensitive. Delete everything inside this folder except jquery-ui.css and the 'images' folder. Upload the folder inside of it to wp-content/uploads/formidable/css. With this folder is in place and named correctly, the stylesheet from your site will be used. If you're not sure what to name the folder, you can find a list in Github to help. 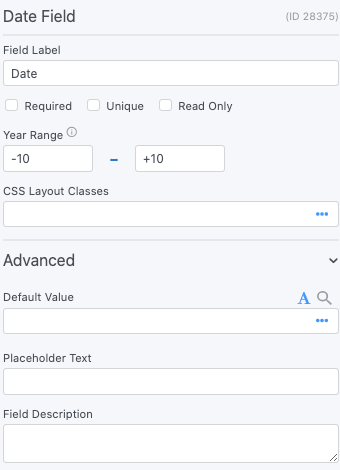 The default value icons can be used to specify whether the text entered in a Date field on the form builder page should be a default value or a placeholder. Learn how to set a default value and how to set a placeholder in a Date field. You may replace m/d/y with any of the accepted PHP date() format characters. Display the value submitted in a Date field in a form's confirmation message, email, or View. Display the value submitted in a Date field. By default, the date will be displayed in the format entered in your WordPress → Settings → General page in the 'Date Format' setting. Replace x with the ID or key of the Date field. Display the value submitted in a Date field with the format of your choosing. You may use any of the PHP date() allowed format characters. Replace x with the field ID or key of the Date field. Display the number of days, weeks, months, or years ago the entered date is from today's date. See the Field Calculation page for step by step instructions on how to calculate a users age. where end-date is the id or key of the end Date field and start-date is the id or key of the start Date field. Use this shortcode in a View to show the difference in days between two date fields or a date field and the current date. Use the start and finish parameters to indicate the start and finish dates. If you don't include a start or finish parameter, the current date will be used for that parameter. To use [created-at], add a format that only has day, month, and year. Often, if the datepicker calendar is not appearing, the problem can be solved simply by clearing any caches on your site and in your browser. If you're not seeing any text on the datepicker month and year fields, your theme might be introducing this conflict. To override this, you can use the custom CSS below to change it to a darker color which will make it more visible. This example will allow you to adjust the width of the datepicker field in a form. You can add this to your Formidable > Styles > Custom CSS. Follow these instructions if you want to force your users to select dates using the datepicker and not by manually typing in the date. Add blackout days, custom date ranges, calendar icons, etc with the frm_date_field_js hook. Require a minimum age for form submission with the frm_validate_field_entry hook. Save the date in a different format with the frm_validate_field_entry hook. Calculate a final date with the frm_validate_field_entry hook. Change the date format for entries exported as a CSV file with the frm_csv_date_format hook. Black out days of the week so that the user cannot select the day with the frm_selectable_dates hook.